Fake86 is used in a similar manner to QEMU, but Fake86 does not support 386 and newer code. Some programs that require a 286 still run in it. It is excellent for running many old MS-DOS applications and games. It can be used with raw hard drive and floppy image files, and includes the imagegen utility which can be used to create new blank hard drive images. Unlike DOSBox, there is no built-in DOS kernel. That was not the goal with Fake86, I wanted it to be able to run any real-mode OS the user wants. You will need to use the included imagegen tool to create a blank hard drive image, and use a DOS install floppy image to partition and install the OS. Fake86's source code has been written entirely from scratch, including the CPU core. It is not based on any existing emulator. I expected that it will get label 'hard to use', because yes it's somehow not intuitive. I wanted to create gui for it 'EX Launcher', but finding no time for it, so it stays in original form unchanged form. There are a places that could be improved, here and there. in the emu anyway.. I really like the game that is included. 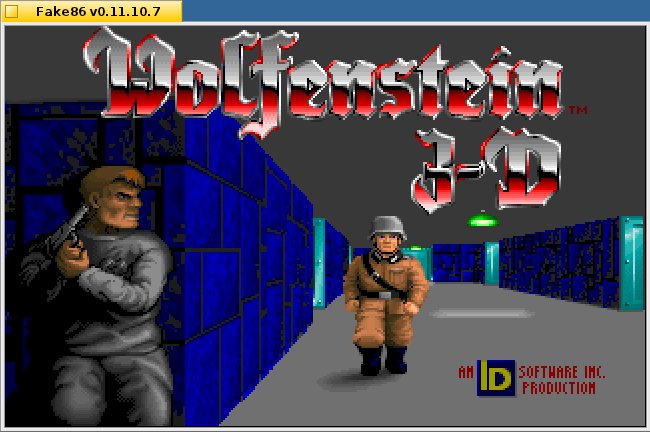 Just wish I could download and play Wolfenstein 3d or any other game for that matter. I do not think this is a user friendly emulator but neither is any DOS emulator IMHO. 3/5...would be 5/5 if I could do anything else with it.